We only have a few precious years on this wonderful planet, so why not find out what you can about it while you still have the chance? Writing a book is, it turns out, a hard slog. Who'd have thought it? 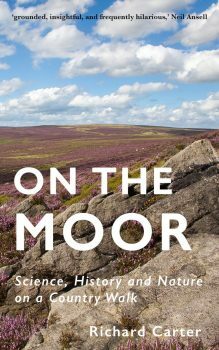 At face value, going for walks on your local moor, then going home and writing about them sounds pretty damn easy. Come to think of it, that probably is pretty damn easy. But On the Moor is about a lot more than that. My book was inspired by my walks on the Moor. It's not so much about the walks themselves, as the things I saw on my walks, the thoughts they inspired, the stuff I already knew about them, and the stuff I subsequently found out. It was this finding stuff out that made the hard slog worth while. It was tremendous fun researching the stories and ideas behind the things I encountered on my walks. Especially when I unearthed some (occasionally tenuous) connection between something I had encountered on the Moor and people, ideas and events in the wider world. Darwin kept cropping up obviously. Darwin has a habit of cropping up when you're a self-confessed Darwin groupie. But digging deeper into what I found on the Moor introduced me to dozens of new stories, ideas and heroes. Which is why I was delighted to see a post on one of the Guardian Science blogs earlier this week about the 1911 British Terra Nova Expedition's hazardous scientific detour to collect eggs from the Cape Crozier emperor penguin colony in Antarctica. I had heard the tale of this detour before writing On the Moor, and even had an copy of Apsley Cherry-Garrard's account of the Terra Nova Expedition, The Worst Journey in the World, sitting shamefully unread on my bookshelf. But, before I began writing my book, I would never have guessed that there was a direct (in this case, not at all tenuous) connection between something I see pretty much every time I go up on to the Moor, and the legendary 1911 wild penguin chase. The underlying message of On the Moor, such as there is one, is that finding stuff out like this is great fun. We only have a few precious years on this wonderful planet, so why not find out what you can about it while you still have the chance—and enjoy yourself while you're doing it? You'll be amazed at how even the most ordinary of local patches has tales to tell, if you're prepared to dig a little deeper. 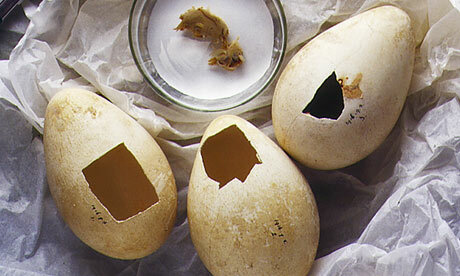 As featured in my book: the three emperor penguin eggs collected at Cape Crozier in 1911. So, what's the connection between my local moor and the 1911 expedition to collect penguin eggs? Obviously, you'll just have to read my book to find out. Or you could try to find out for yourself—which, hard as it is to conceive, might be almost as much fun.